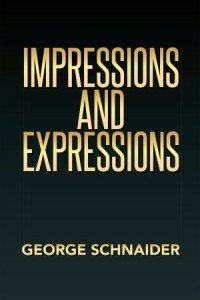 The following is a guest post by George Schnaider, author of Impressions and Expressions. If you would like to write a guest post on my blog, please send me an e-mail at contact@cecilesune.com. In 1984, I was struck by a car while I was walking along the shoulder of a road. I was nearly killed. I spent three weeks in a coma, four weeks connected to a life support machine, seven months in the hospital, and two and a half years in rehabilitation. I recovered from my injuries and am able to live a normal life, but a lot of people who go into comas never come out, or if they do, they often have to deal with serious emotional or mental problems. I was spared all of that and I came to understand that I did not recover as well as I did because I was lucky. I recovered as well as I did because I was saved by God. In my new poetry book, Impressions and Expressions, I explore my feelings on life, our world, humanity, society, nature, and God. I also chose to write some poems on abstract topics such as space, dreams, and time. I wanted to vary my subject matter, as well as the structures of my poems, to make the book more interesting to read and to appeal to a larger audience. If I kept the structures of my poems similar and the subject matter limited, the poetry would become monotonous, boring, and unappealing. I also chose to devote a large segment of my poetry to God, because God is the inspiration for my poetry and the reason why I wanted to publish. I have felt God’s presence twice in my life. God has allowed me to feel the inevitability of his power, the measure of his love for people, the depth of his compassion, and the extent of his gentleness. God has also blessed me with a unique understanding of life, which I want to share with people. God has given me many blessings, and God has improved the quality of my life substantially. I wanted to create a book that was entertaining, but I also wanted to create a book that would explore the beauty of life, this world, and people. I also wanted to articulate my feelings on the dangers and the evil in this world and in man. I wanted to point out the reality that we are all a part of, but that many people either do not understand or choose to ignore. I am hopeful that I can inspire people to seek a relationship with God because I know that a relationship with God will lead to significant, positive changes in the quality of their lives There was a time when I had literally lost everything I had, and all I wanted to do is die, but a friend of mine convinced me to start attending church and once I had a relationship with God my life changed immensely for the good, and it will for others who seek God. To summarize, I would just like to say that the poetry in my book is deep, meaningful, and inspirational. It is relatable, it is sincere, and it is compelling. Thank you very much for taking the time to read this blog and I hope that you will find my poetry appealing. She entered my world with an angelic grace. A whisper from heaven was cast as her voice. The gold in her hair and her amazing flair. She struck me to be God’s loveliest choice. Her presence is like pleasant peace in a storm. She smiles like a merciful savior from tears. A cheerful hello turns me into Jell-O. Her laughter extinguishes all of my fears. She seems peaceful, just like a butterfly’s flight. A joyful demeanor, with a strong spirit. She’s friendly and kind, with a nice playful mind. Her warmth feels wonderful when you are near it. Equal in beauty, both inner and out. A treasure of loveliness beyond belief. Her aura, her glow, leaves me honored to know. An outstanding lady I call a sweet leaf. Poem excerpted with permission from Impressions and Expressions by George Schnaider, Xlibris 2014. George Schnaider lives in Oshawa, Ontario with his wife and enjoys international travel, including to former Yugoslavia and Brazil.